Buy interest in private companies all over the United States. Research and invest in funds with a multitude of investment strategies. The alternatives marketplace is now open. FNEX is a comprehensive transactional marketplace for alternative investments. FNEX enables investors to make investments into private companies, hedge funds and a variety of other investment vehicles listed on the platform by investment banks, managed futures brokers and fund managers. A glut of listings will force second-tier startups to go public, or else they might miss their chance. The wealth created in 2019 when several of America’s highest-valued startups go public should be particularly sweet for one reason: They were founded during times of economic destruction. There’s never a cost for investors to create an account or invest using FNEX. Sign up today to create your free investor account. 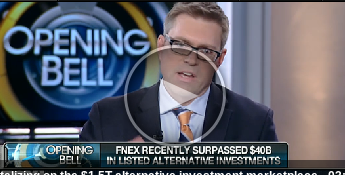 FNEX CEO Todd Ryden appears on Fox Business' Opening Bell. FNEX, The Private Securities Marketplace. As an investor, your membership to the platform is 100% free. To learn more, please watch our video. Private placements and other alternative investments involve a high degree of risk. Many of these offerings are illiquid in nature and may require holding periods in excess of your need for liquidity. These investments may result in the complete loss of your principal. Investors must conduct their own investigation of the merits and risks of each opportunity. Companies seeking private placement investments tend to be in earlier stages of development and thus have not yet been fully tested in the public marketplace. The value of investments and the income from them can fall as well as rise. Past performance is not a guarantee of future performance. Investment products on this site are not FDIC insured, may lose value, and there is no bank guarantee. Please read all offering documents closely. I have read and agree to the Confidentiality Agreement.